An 18-year-old, who was stabbed at a KFC restaurant in Sussex last night, is in a ‘serious but stable condition’ after being transferred to a London hospital. Officers were called to the KFC in London Road, Brighton, after reports of a stabbing at 8.25pm last night (Saturday, July 22). The victim had sustained a stab wound to the stomach, police said. He was taken to the Royal Sussex County Hospital but transferred late the same night to Kings College Hospital in South London. He remains in London in a ‘serious but stable condition’, confirmed police. 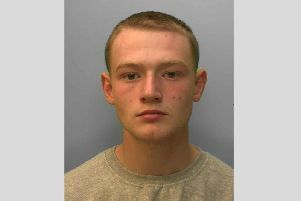 Police are searching for an 18-year-old Brighton man, Jordan Ash, who is wanted for interview over the stabbing. Police describe Ash as white, 5ft 9ins, of slim build, with dark brown hair and brown eyes. A 15-year-old boy has been arrested on suspicion of unlawful possession of a knife and a 23-year-old man was arrested on suspicion of possession of cannabis, police said. Both are from Brighton and were arrested at the scene. They are currently in custody for interview and further enquiries in relation to the stabbing, police said. Another 18-year-old man, from Portslade, sustained minor cuts and bruises during the incident, said police – adding that these are not believed to have been caused by the knife. Police are examining a knife to establish whether it was involved in the attack. Detective Inspector Andy Wolstenholme said; “We responded very quickly and we are working to establish the full circumstances of the attack, but it appears that the victims were deliberately targeted rather than it being carried out at random. “If you know where Jordan Ash is or see him, do not approach him but please contact the police via 999 quoting serial 1363 of 22/07. “If you have any other information, saw what happened, or have seen any mobile phone footage of the incident, please contact us online. “You can also contact the independent charity Crimestoppers anonymously on 0800 555 111 - www.crimestoppers-uk.org. “I cannot stress enough the serious repercussions of carrying a knife in public or using one on another person. “Victims may lose their lives or face life threatening injuries, and offenders face long custodial sentences.